In November 14, 2005, Namtso Lake was selected as one of the five most beautiful lakes in China by Chinese National Geography magazine. Namtso Lake’s touching beauty should not be missed by any traveler who visits Tibet. Its purity and solemnness are symbols of Qinghai-Tibet Platean. In Tibetan, Namtso means ‘Heavenly Lake.’ It is considered one of the three holy lakes in Tibet. Namtso is famous for its high altitude (4720 meters (about 3 miles)), vast area (1961 square kilometers (about 757 square miles) as well as the beautiful scenery that surrounds it. Namtso has five uninhabited islands of reasonable size, in addition to one or two rocky outcrops. The islands have been used for spiritual retreat by pilgrims who walk over the lake’s frozen surface at the end of winter, carrying their food with them. They spend the summer there, unable to return to shore again until the water freezes the following winter. This practice is no longer permitted by the Chinese Government. Today begins with a flight from Kathmandu to Lhasa on Air China .The one hour thirty minutes Trans Himalayan provides some fantastic views of Mt. Everest and other Himalayan Peaks .We arrive at Gonggar airport around 14.00 hrs. local time and after clearing immigration and customs there is a two hour drive to Lhasa situated at an altitude of 3670 meters. Upon arrival we check in to our hotel in the heart of the old city. Two days are spent in Lhasa visiting all the sites of historical and cultural interest,including the Potala palace, Sera and Drepung monasteries, the Norbulinka palace and Jokhang temple and the surrounding Barkhor Market. Today we embark on a roundtrip that provides an outstanding opportunity to see the real Tibet. 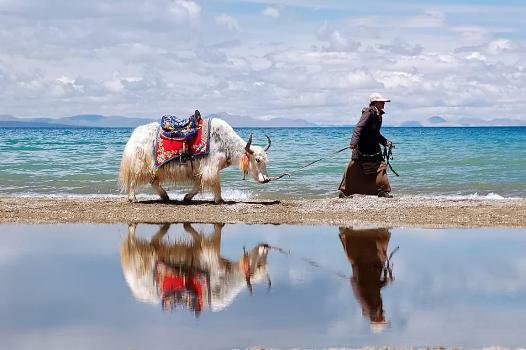 Great mountains, huge grasslands, local nomads, sheep, yaks, goats, horses and perhaps most importantly Lake-Nam-Tso at an altitude of 4718m high. It is the second-largest saltwater lake in China the first being Koko Nor (Qinghai-Lake) in Qinghai province.In clear weather the water is a miraculous shade of turquoise and from here there are magnificent views of the nearby mountains. The wide open spaces, dotted with the tents of local drokpas (Nomads) omly add to the experience. On the way back to Lhasa we stop at Yangpachen Hot spring for an optional dip. Early morning drive to Gyantse on the way we cross over the Kamba la (4794m) and the Karo la pass (5010m) both passes provide spectacular views. After crossing the Kamba La we drive past Yamdrok tso, also known as the Turquoise Lake . Altitude 3900m. In the morning visit Gyantse stupa and monastery before a two hour drive to Shigatse.At Shigatse there is an enormous Buddha in the famous Tashilumpo monastery. The seat of the Panchen Lama. Altitude 3800m. The journey today is relatively short we travel over two high passes with fine views before stopping in the small town of Lhatse and overnight . Altitude 4350 m.
Today begins with the crossing of the Tsho La (4500m) and ends with the spectacular views of Mt. Everest from Rombuk monastery. Relax tonight and stroll around the monastery. Altitude 5050m. Early morning start for a two and half hour leisurely walk (one way) to Everest base-camp (5200m). Return early afternoon back Lao Tingri. Lao Tingri is a small Tibetan town that offers the best views of Everest anywhere. Altitude 4200 m.
Today we make our way back to Nepal and on route to Kathmandu there are some splendid views from the Lalung la pass (5050m) on the way. In the evening relax in Kathmandu .